Robin Youngs, Edward Fisher, Musheer Hussain, Jonathan Fishman,	The Journal of Laryngology & Otology, Volume 130 Issue 2, p 111. M Mozaffari, J M Fishman, N S Tolley,	The Journal of Laryngology & Otology, Volume 130 Issue 2, pp 112-115. K Stewart, P Sen,	The Journal of Laryngology & Otology, Volume 130 Issue 2, pp 116-120. R Lenzi, S Fortunato, L Muscatello,	The Journal of Laryngology & Otology, Volume 130 Issue 2, pp 121-127. M Sagit, S Guler, A Karaman, M Yasar, A Emiroglu, I Ozcan,	The Journal of Laryngology & Otology, Volume 130 Issue 2, pp 128-133. V Anand, H N Udayabhanu,	The Journal of Laryngology & Otology, Volume 130 Issue 2, pp 134-144. P Eza-Nuñez, C Fariñas-Alvarez, N Perez Fernandez,	The Journal of Laryngology & Otology, Volume 130 Issue 2, pp 145-150. B Pateron, D Bakhos, A LeLouarn, P Bordure, A Bozorg Grayeli, B Godey, E Lescanne,	The Journal of Laryngology & Otology, Volume 130 Issue 2, pp 151-156. Glue ear: how good is the information on the World Wide Web? L Ritchie, C Tornari, P M Patel, R Lakhani,	The Journal of Laryngology & Otology, Volume 130 Issue 2, pp 157-161. O Kemal, T Müderris, F Başar, G Kutlar, F Gül,	The Journal of Laryngology & Otology, Volume 130 Issue 2, pp 162-165. R Nash, R Fox, R Srinivasan, A Majithia, A Singh,	The Journal of Laryngology & Otology, Volume 130 Issue 2, pp 166-168. M S Miah, P Nix, A Koukkoullis, J Sandoe,	The Journal of Laryngology & Otology, Volume 130 Issue 2, pp 169-175. A Maimaiti, A Mijiti, A Yarbag, A Moming,	The Journal of Laryngology & Otology, Volume 130 Issue 2, pp 176-182. K L Whitcroft, B Moss, A Mcrae,	The Journal of Laryngology & Otology, Volume 130 Issue 2, pp 183-189. 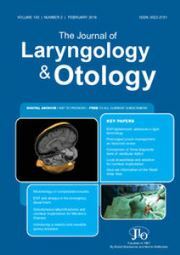 Y-A Tsou, T-S Li, M-H Tsai, H-C Chen, P Belafsky,	The Journal of Laryngology & Otology, Volume 130 Issue 2, pp 190-193. A Keilmann, F Bendel, S Nospes, C Lampe, A K Läßig,	The Journal of Laryngology & Otology, Volume 130 Issue 2, pp 194-200. N Giblett, C Hari,	The Journal of Laryngology & Otology, Volume 130 Issue 2, pp 201-203. R L Heywood, M D Atlas,	The Journal of Laryngology & Otology, Volume 130 Issue 2, pp 204-206. E V West, F Sheerin, J E H M Bates,	The Journal of Laryngology & Otology, Volume 130 Issue 2, pp 207-209. Z C Lou,	The Journal of Laryngology & Otology, Volume 130 Issue 2, p 210. K Larsen,	The Journal of Laryngology & Otology, Volume 130 Issue 2, p 210.